Made you look twice didn’t I? 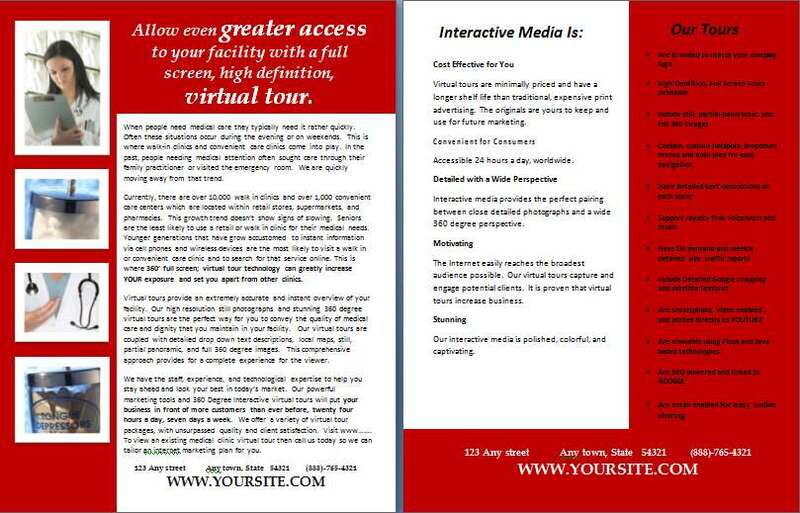 AlamoAreaVirtualTours.com knows that advertising can be expensive for us small virtual tour businesses. We all agree on that. That is one reason for social networking as we find that opens doors that even advertising won’t open. However, if you have forgotten, we as RTV providers have a unique way of helping others advertise at a phenomenally low cost and be effective. As you well know there is a section in your TMS called affiliates where you can put small banners on each virtual tour that you make. I see that some virtual tour providers in the RTV network use them better than others. It has been recommended that there be no more than 8 affiliates for a virtual tour, depending on the length of the virtual tour. (Obviously you want all affiliates to cycle through at least once.) Each showing is about three seconds. These affiliate slots are not simply a small banner on the tour, but they are eye catching as they blink on and off. That may be good for the affiliate to be advertising, but how does that help your bottom line? Simply sell those slots! 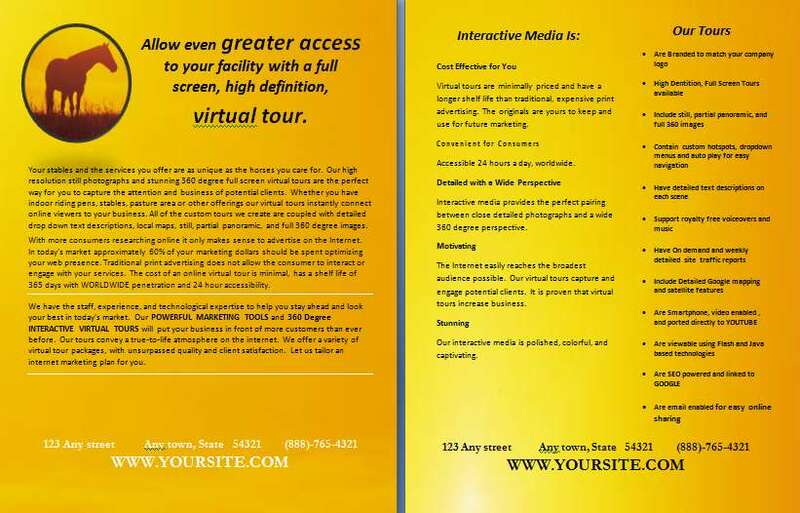 San Antonio Virtual tours Real Estate support elements i.e. home inspectors, A/C repairmen, remodelers, and the list goes on, are happy to get a slot for $5 or $10 dollars knowing they’ll be seen every time a tour is viewed. Just add each advertiser to your hit report so they can see the traffic on the tours they advertise on. Remember that the affiliate slot is a click to link to their website. When a viewer mouses over, the name of the company shows and a click takes them there. I have found those businesses are happy for such advertising at such a cheap cost to such a targeted audience. First check and get approval from your customer to allow affiliates. What I do is split the fees. That can cut the cost significantly for the customer and bring in more cash for you the provider. Don’t discount this till you try it!!! It works for me and it can work for you. Listen to Suzanne and get out of your comfort zone! Recently I was diagnosed with Celiac Disease which is an autoimmune genetic disease. Luckily, this disease can only be treated with one very potent drug….food. There is no Chemotherapy, there are no potent drugs with side effects. However, I have noticed that because my food choices have become more limited – no items with gluten (bread, cake, pasta…and hidden gluten in everyday processed foods), that in order to be SAFE, I stick with the same food choices. Every day I eat the same breakfast, the same lunch and basically the same dinner. Boring, but safe. In reality, there are many foods, food substitutes and great new choices for me to make. However, recently my family challenged me to spread my wings and try new things . I have discovered Almond Bread, Pumpkin Bread, Rice based Pastas and Pizza and many new foods. How does this relate to RTV, Virtual Tour Software, Virtual Tours and business in General. We become safe in our choices. First out of fear of not knowing how to integrate new things, and then we find a comfort zone. I want to challenge every RTV provider to get out of the rut and try something new. Each and every one of you knows how to use your pano head and camera by now. Most of you only use it to take Virtual Tours of homes. Here is a great suggestion to have some fun with the Pano Head and break out of the comfort zone. Take the pano head and camera on vacation. Try shooting a few virtual tours of the beach, of the hotel and of your hotel rooms (great practice for tour tracks). Take virtual tours of street fairs or natural landmarks. When you get home, add your stills of your vacation and create a Virtual Tour or a new RTV HD Slideshow of your vacation. It only costs you one tour credit (You can earn this credit by blogging with RTV or various other incentives that they always offers). Then share the tour with family and friends, share on facebook, through a personal website, through the various social networking sites to which you belong. 1. You can see how the pano head functions in locations that might require real tours – i.e. hotels, museums, iconic landmarks or parks, cities, stores, etc. And, you have built a virtual tour showing your skills to share with a potential client. 2. It expands your comfort zone to new areas that you can photograph. You have the practice on your own photos rather than a clients photos and you can see your success. 3. You widen your horizons and begin to think outside the box. Hope to see you outside the COMFORT ZONE and if you ever invite me to dinner, remember I am gluten –free! 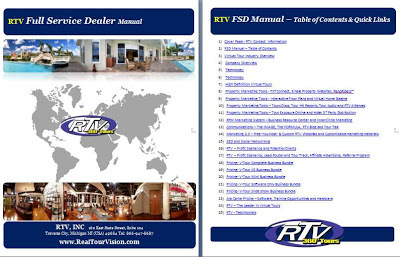 I got my first virtual tour client from a lead that RTV gave me back in January of this year, having personalized and printed out most of the virtual tour marketing materials available from Rock Point Marketing. He purchased one of my 360 Virtual tour packages and paid an extra $25 for the “Exposure Engine”. All you gotta do is put the Virtual Tour on Realtor.com and presto, it goes out to 93 other websites. My first client was a property management company with 44 properties, none of which were for sale. I found out that a property must be for sale, with an MLS# to be on Realtor.com. I really didn’t understand the difference in the 3 distribution options. I created Postlets (and later used Vflyer.com) and put them on Craigslist. The client still didn’t get the results that he desired (he was expecting distribution to 93 websites), until I wrote a rather long email to each of the onsite property managers, explaining how they were to use and keep the postlet/ vfler distributed on Craigslist and any other website they could find that wasn’t already a part of the syndication list. This one of my virtual tours that I’m particularly proud of. (The 3rd picture of the entry fountain was replaced by a photo that the manager took, so it’s not in HD) Check out the hit stats, the manager of this complex (Ambassador Inn) is really on top of keeping the ad distributed. http://rtvpix.com/BU-3909-JX4DV5-01. Some of the other apartments that I did a tour for are only getting less that 5 hits a week, while this one is consistently getting over 100, peaking at over 400 hits in the week that I sent the email that I mentioned in the previous paragraph.. I called Realtor.com last week and they verified what I was told a few months ago. Then, while I was revising my contract and price list to include RTV’s awesome new HD Slideshow and Broker/ Agent websites, I noticed that BlueLaVaMedia was a “Realtor.com Approved Vendor”. I called back to ask what this meant and was told that BlueLaVaMedia simply used RTV’s Picture Path portal to allow us RTV providers easy pushing to Realtor.com. I began to think that maybe I could just become a Certified Picture Path provider too and gain additional exposure for my company. You can post photos and tours to a property thats on the site. You will need the five documents that are in a ZIPPED file on www.rockpointemarketing.com to become a vendor. It’s really that simple! If you give them your credit card, they will charge you $20 per tour that you posted in the previous month, on the 15th of each month. This is why you’re charging the client $25 to offset this minimal charge. Make sure you understand the adversting guidlines. The 3rd one is directly related to our affiliate ads and single property websites. Any affiliate ads have to be requested and or approved by the realtor and cannot be for services competing with what Realtor.com provides. 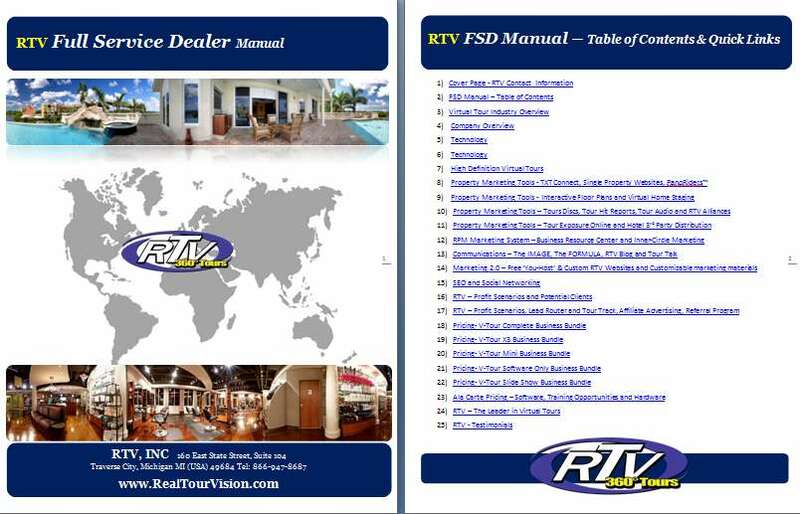 Attention all RTV Virtual Tour Providers! New Summer marketing pieces are now available in your marketing site. We updated and posted the NEW Full Service provider manual complete with current pricing for each of our new Business Bundles and a quick link table of contents. Targeting a niche market is a great way to focus on a property type and strive to gain their business in a systematic manner. Horse stables are another property type that could really benefit from a virtual tour. This is a 2 page flyer that is ready for you to easily insert your company name and contact information. The use of walk in clinics and urgent care centers is rapidly increasing. There are currently over 10,000 walk in clinics and over 1,000 convenient care clinics in the United States. 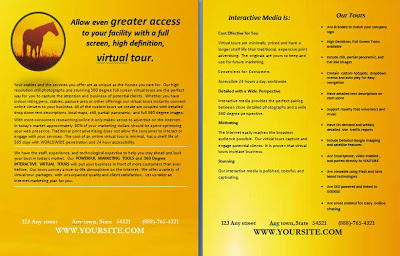 This two page flyer clearly states how their business can benefit from YOUR virtual tours.